It is difficult to find affordable luxury resorts that are not big, imposing eyesores gobbling up waterfront property on what used to be untouched stretches of beach. Mostly, where there is one resort, there are usually many and they become crowded with noisy, spoiled tourists. And, admittedly, there is something colonial about the whole thing – rich westerners coming to live in gated communities staffed by locals. 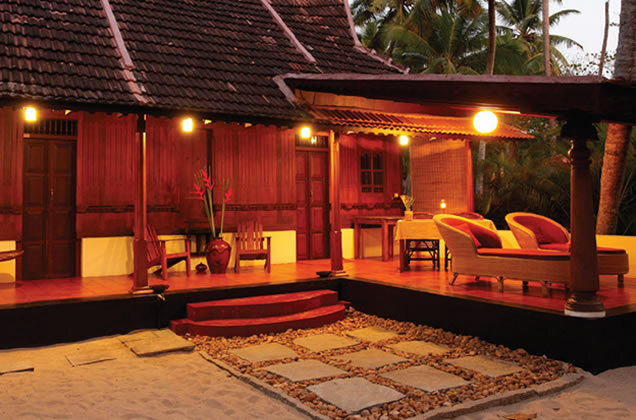 Not so with A Beach Symphony, a boutique eco-resort in Alleppey on the south-western coast of India, run by a Belgian couple since 2007. In fact, Flemish couple Jan and Cristel Arryn shy away from using the word resort altogether, calling it a beach “stay”. It is boutique in the true sense – there are but four cottages on the beach and the layout and tasteful, understated décor are such that you feel very much at home in your own personal vacation bungalow. There are little to not sight lines of the other cottages and when there are, the landscape architecture has been done in such a way that the foliage provides for a high-level of privacy. The staff are discreet, their service is impeccably timed, and your meals are served on the expansive balcony (there is no restaurant ) so you never have to leave your day bed, lounge chair or hammock. Perfect for the overworked businessperson, the hermit or the famous celebrity keeping a low profile . One of the most attractive features is that the cottages were originally fishing huts that were remodeled but still retain the original authentic feel so that eating seafood caught by the local fisherman becomes an historical experience. At the shore, which is about 150 meters from the cottages, the beach is just as pristine: no shops, no vendors hawking their wares, no swarm of surfers, kite surfers or jet skiers. At peak time, there are all of eight white people, a handful of Indians swimming in their clothes (as per conservative Indian culture) and fishermen repairing nets. A Beach Symphony is a place where you understand, from the moment you read the welcome package , that it was created with the Indian community in mind – there are tips on how much to tip the staff, making a charitable donation to a local school and a reminder about water shortages in the region in the section on cleaning and laundry facilities. It is the antidote to Goa and let’s hope, for the sake of those for whom taking a vacation is not about flocking to the popular holiday spots, it stays that way. It is here you will discover the unique flavour of Kerala culture in your own time, at your own pace.